Not to be confused with the Commodore 64 adventure game Citadel (Commodore 64) by Electric Dreams, nor with the Sinclair QL arcade game by Eidersoft. Citadel is a computer game released in 1985 for the Acorn Electron and BBC Micro by Superior Software. A platform game with some puzzle solving elements, the game's plot involves finding five crystals hidden in various locations in a large castle, together with areas outside it (including a wasteland, a pyramid, a sea and an island) and returning them to their rightful place. 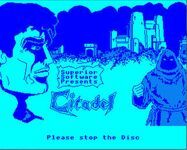 Citadel was unusual at the time for playing digitised speech before loading the main game (in part to advertise Superior Software's "Speech!" program package), as well as having other special effects advanced for the time, such as splashing water sounds. Source: Wikipedia, "Citadel (video game)," available under the CC-BY-SA License.